Is There Anything Better Than a Chocolate Gift Basket? When you want a unique way to celebrate a special occasion, send a ‘thank you’ token, or just cheer someone up, chocolate gift baskets provide many chances to make it a notable event. It’s uncommon to find a person who doesn’t like chocolate, and picking chocolate gift baskets for that special event can be an easy way to send some good energy in a unique way. Chocolate gift baskets can range from simple varieties of quality chocolate bars and baked goods, to extravagant candy bouquets that holds the recipient’s favorite brands of chocolates. From tasty truffles to delightful cookies, you’re guaranteed to find something amazing for that upcoming occasion. Chocolate gift baskets are a good choice for a hostess at the dinner party, a wedding celebration, or even as a get well soon gift for a person who is sick. Stocked with samples of top name brand chocolates and chocolate bars, chocolate gift baskets make it simple to send an extraordinary gift. For the recipient who has a gourmet chocolate sweet tooth, an assortment of premium chocolates are available from the world’s finest chocolatiers. Milk chocolate, caramel-filled chocolates, and dark chocolate truffles make it simple to make a customized chocolate gift basket for any chocolate lover. Dark chocolate squares and milk chocolate balls can be used as fillers to make a unique assortment, along with giant chocolate bars, coffee samplers, and boxes of mint chocolates. These can be incorporated in any size gift basket, making a personalized gift with the recipient’s favorite tastes in mind. 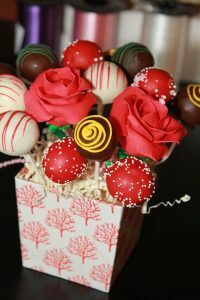 Candy bouquets offer a great option for candy enthusiasts. 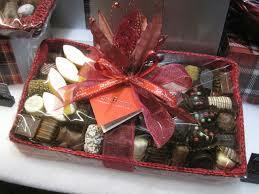 Chocolates and flowers can be put together with the recipient’s favorites. If you’re looking for an easy way to put someone in good spirits, chocolate gift baskets provide a good alternative to a balloons or flowers. Many individuals connect gift baskets with Christmas, Easter, housewarming, or work promotions. Gift baskets are fantastic presents for these celebrations as well as many others. Gift baskets, likewise, make an excellent gift for Valentine’s Day. With numerous gift baskets available currently for specialty gift giving, it’s not surprising that people are beginning to discover that Valentine’s Day is the best occasion for gift baskets. If ever there were a “bigger is much better” occasion, it would have to be Valentine’s Day. A lots of red roses is nice, however, three dozen red roses with baby’s breath, as well as an elaborate flower holder is something really unique. Because of this alone, Valentine’s Day git baskets triumph, so to speak. 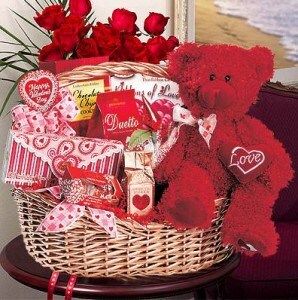 The majority of Valentine’s Day gift baskets are available in a number of sizes and also could be sent out with blossoms, balloons, teddy bears, or almost any other expression of love. Most importantly, Valentine’s Day gift baskets typically aren’t just limited to chocolates, although delicious chocolate is just one of the most popular additions for Valentine’s Day. From high-end fragrances and health club items, to exquisite foods and candies, there is no restriction to the choices offered when choosing a Valentine’s Day gift basket. Lots of gift basket sellers take fantastic care to put together Valentine’s day gift baskets that are filled with products designed to make this really special day an unforgettable one. Take it from me, premium food gift baskets with blossoms are an outstanding present to send out to your loved one at his or her office. Flowers consistently rack up points on the “love scale,” especially before a person’s colleagues. However, a chocolate or premium food gift basket will be something the whole office can value. There is no far better way to turn them from envious to appreciative, and it will certainly bring everyone by your liked one’s workdesk to stop and take a look.